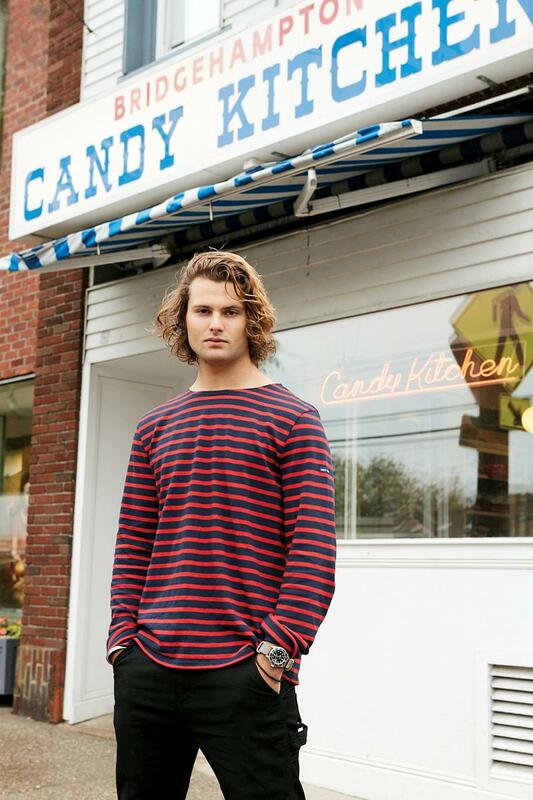 Don’t let Jack Brinkley-Cook’s good looks fool you—whether catching waves in Montauk or taking hikes in Bridgehampton, you’ll likely find the 22-year-old son of supermod Christie Brinkley hitting the outdoors instead of a nightclub—with the exception of Surf Lodge, of course. What was it like growing up in the Hamptons? It was really nice, because it’s so beautiful out here. When the weather was bad, or if there was a party going on in the city, I could be in Manhattan in two hours. I feel like I grew up between the two places. Did it ever get boring? I wouldn’t say I was bored—on the weekends, all my friends were out of school, so we did what kids did. When I went to the city, I’d stay at my older sister Alexa [Ray Joel]’s apartment for a night. But when I come back now after living in the city for three and a half years and living in Boston a year before that—I studied at Emerson my freshman year—I kind of think to myself, I don’t know if I could do it out here on a Wednesday in February or March! How has the Hamptons changed? It’s just getting busier, but since I’ve been able to participate in the nightlife and social scene in the Hamptons a bit, I like the progression. What spots do you hit up now? Me and my friends are more likely to have a bonfire on Ocean Road Beach than ever go to a club, aside from Surf Lodge, because we love it there. We surf all day in Montauk, grab lunch, and then head over to Surf Lodge in the afternoon. They always have great music and good vibes. Most of what I do in the Hamptons is outdoors! I’m getting into fishing. I’m not really catching much, but I’m trying. My house in Bridgehampton is on a decent amount of property, a lot of which is woods and has nature trails throughout. Occasionally, my friends and I will hike through the woods, but the ticks kind of killed that. I started surfing when I was young but really got into it around six years ago. Surfing has become a huge part of my life. My friends and I are constantly checking the surf report. Even in the winter, if we see the conditions will be good, we’ll pack a bag and head out East at the crack of dawn. When did you realize that your mom was a supermodel? I was 10 years old, and we went to the premiere of a Harry Potter film. I remember Daniel Radcliffe came up to her and I was like, “That’s Harry Potter!” I think that was the first time that I realized she didn’t have a normal job. Was she strict when you were younger? Like any kid, I had my mishaps here and there, and when she needed to be strict, she was, but she’s a pretty outgoing, energetic person. She was also really focused, too. She runs a ton of businesses—she works harder than anybody I know. She’s constantly traveling, and when it comes to business and that stuff, she’s serious. What’s the best piece of advice your mom has given you? As cliché as it sounds, she’s always been hugely encouraging of doing what we love. Life is too short to not do something that you want to do every day. My sisters and I have understood the importance of that. What does she think of your shirtless Instagram posts? Was there ever pressure to get into modeling? I never really felt the pressure of following in my mom’s footsteps. My little sister [Sailor] has these incredible blossoming careers in modeling and photography. My oldest sister [Alexa] is a musician, and she does shows all over and does really well. My mom was good about encouraging us to do what we wanted. She wanted us to find our interests and then pursue them. How did you end up studying acting? After my freshman year at Emerson, where I was studying marketing, I realized that marketing wasn’t what I wanted to do. I applied to the Lee Strasberg Theatre & Film Institute, which is where I am now. It’s been my home away from home in the city. I’ve been in a short film and I’m auditioning around, which is pretty easy, because if I have to miss class, they understand! Are you into the theater scene out East? Yeah. Bay Street Theater is a fantastic amenity. Every summer for the past four or five summers, my mom is in a show at Guild Hall in East Hampton—which is an equally impressive establishment and platform—that’s a comedic take on reading genuine autobiographies from celebrities. It’s pretty hilarious. In October, my mom and I go to the Hamptons International Film Festival religiously. That’s sort of our thing—I look forward to that probably more than any other weekend over the course of the year. What’s the dynamic like between you and your sisters? Alexa was living in the city when I moved there—Sailor wasn’t there yet—so Alexa became my go-to person for advice. She and I have traveled on our own more than Sailor and I have, so that’s a special bond. The last place we went to was the Caribbean. My mom has a home there. Sailor and I grew up together in the Hamptons. We both went to the Ross School, so we got into a little trouble together. She’s my little sister, so I always look out for her, but she has actually now become friends with all my friends. Why did you and Sailor keep both of your parents’ names? It’s funny—I don’t know exactly when that kind of happened. I write my name as Jack Brinkley-Cook and I noticed recently that Sailor doesn’t include the hyphen. People just always referred to me as Jack Brinkley-Cook over Jack Brinkley or Jack Cook, so it sort of just became what it was. Is it a full house in the Hamptons during the summer? It tends to be. Alexa spends the majority of her time from June through September at my mom’s house. Sailor is in and out. I’m in and out, too, but you can count on the weekends being full. In the city, it’s so easy to order takeout. Out here, we don’t have Postmates, so I’m more likely to cook. I try to eat healthy, but I can’t compare to my mom and my sister. My mom is a pescetarian, and Sailor is a vegan and gluten-free. Alexa eats a little meat, but really only white meat—she eats healthy as well. I try to eat healthy, but I sort of stretch the boundaries. Last night, I was looking around the kitchen, and everything was just soybean this and almond milk that. The only thing that seemed a little bit on the edge was a Bisquick pancake mix, so I ended up making pancakes! Huh? So now kids of celebrities get articles written about them for no other reason than having a famous parent? At 22 he has done absolutely nothing worthwhile. An easy rich boys life is all he had so far. I agree with everything all the posters have said! All of those Brinkley kids are lazy losers: Alexa lives off her Sugar Daddy Billy Joel’s $$ in a fancy NCY apartment and pretends to be a “singer-songwriter”. Jack (Whose your Daddy?) TAUBMAN/Brinkley/Cook is an Emerson College drop-out who galavants around the world on his Mommy’s dime in one endless vacation, and Sailor potato head pretends to be a model and attends that Trust Fund Kid school, Parsons, but will not graduate because it actually takes WORK to get a degree. I dare Jack and Sailor to drop “Brinkley” from their last name and see haw far that gets them in life. they are all PATHETIC. I agree Jamet. It looks like life for Jack is one never ending vacation if you look at his social media. Brinkley can never get enough attention and now shoves the kids out there at every opportunity it seems. What do any of them really do? And as for Sailor being a model…good thing the last name is Brinkley otherwise she’d be shown the door. AGREE COMPLETELY. HE AND HIS SISTERS ARE LOSERS. and wealthy parents they’d be working at a regular job just like any other kid. Sailor’s personality is intolerable imo. She’s a bland looking kid who comes across as vapid as her mother. Sailor is a model and Jack is an actor? LOL. This family is way overexposed and the phoniness is non stop it appears. AGREE COMPLETELY. THOSE LOSER BRINKLEY KIDS ARE JUST RIDING ON THE COATTAILS OF THERI RICH PARENTS. This guy has always spent way too much time in front of the mirror, imo. I remember seeing Christie, Peter, Jack and Sailor at an event in EH when the kids were young. Jack’s hair had been tousled JUST SO, his tie loosened JUST SO, his jacket sleeves rolled up JUST SO. I thought at the time, whoa — that kid is just a little too into himself and his “look” — so unnatural for a child his age. Combine his narcissism with that of his mother’s, and you now have (HAHAHAHA) an actor. Um, no. God, it must be nauseating seeing those narcissistic loser out and and about in the Hamptons. Christie acts like her idiot kids have found the cure for cancer. What an insufferable blowhard she is. Jack, you need a bath. you look filthy. Ewwww! There is something about Jack that just screams creepy and smelly! I have seen this said by others in comments elsewhere. His bio dad, Rick Taubman, had that creepy, unkept look as well from what I remember of CB’s 2 second marriage to that one. Jack looks just like him btw. I love how Jack said said he went to Emerson for one year and left. I’m from Boston. There is no way that rich brat would fit in up here for long. Boston probably chewed him up and spit him out! I can.not.stand. CB’s voice and her 13 year old demeanor with her over the top hand and facial gestures when interviewed. She comes across as such a twit. Alexa. Poor ugly Alexa. It has gotten so bad that she has decided to show off her t*ts on instagram probably to take the focus off her face. These kids are pathetic in every way. Ha, Frannie, spot on with those self-important Brinkley twits! And you are correct about Emerson College… that rich, pompous, self- important spoiled little brat Jack was too STUPID to make it in Boston, so the LITTLE WUSS went crying back to Mommy Moneybags. Wow, why all the hatred and jealousy…WHY?? What have these fine folks done to crumble your cookie? What are YOU doing to make this world a better and more beautiful place? Please do share, I’d love to know. Until then, I hope you get over whatever it is that’s troubling you so much. Looking up at the sky and smiling at the vastness of this wonderful universe will help bring you into a higher vibration. And then perhaps, go on a picnic and have some fun! Because they’re phony and self absorbed. Sailor and her annoying mother bash people who don’t think just like them politically. You know, the fake liberals who claim to love the environment yet travel on private planes, etc. Hypocrites and narcissists. No one, who has any sense, can stomach that combination. Exactly! Who but a jealous person would need to be so negative–just to make themselves feel superior. From what I have seen and heard from those three kids they honestly come across as dumb as stumps. It’s a good thing mommy is rich. Working at Dairy Queen would probably be too challenging for them. The MOST self absorbed family and people. The MOST false, PR hungry, narcissistic and greedy people. What a bunch of saps you Christie lovers are. Do you really think she has anyone’s interest at heart except her own? Her products are crap, all she does is self promote, she lends her face to causes but she gets PR for it, free trips and amenities for it, she does not contribute money. It’s all disgusting. And its all to make her more rich. If she was not lucky with genes (she looks like her bio dad), she would be the white trash Monroe MI brunette with 3 kids from different men, pregnant out of marriage, and has quite her own history of infidelity which is kept tightly wrapped up and out of view no one that she really is underneath all the smiling. She and her youngest love to make fun of people. And all the fools who play into her PR are the same ones who follow her vapid kids. Go away Jack. Go visit your Bio Dad. Go get a real job. One word to describe CB “narcissist”. Honestly, who brags about them self & their 3 kids (by 3 different fathers) the way she does. The most hateful of those kids is Sailor who tries to act grown up &’intelligent but does not live in reality (although always tries to have words of wisdom for others). On Election Day this brat allegedly stated how she stood in the hot sun waiting to vote! Poor thing doesn’t realize many people actually work for a living in the hot sun including kids her age at summer jobs to finance their education, unlike her who has hers paid by mommy. If you look at Sailor’s stats on IMG site she clearly does not have the measurements required to model but once again, mommy gets her signed. And the people who admire this family think they “know” them because they follow them on social media. Get a grip people, they don’t give a crap about you! After election CB, & the 2 daughters were crying & thinking of moving to Italy, but nope they’re all still here. I guess CB couldn’t give up her charmed life here & pushing to sell anything anyone will allow her to promote. Have it too good in the ole USA. This Hilary supporter was constantly pushing everyone to get out there & vote, Oops guess that didn’t go their way! Jackie boy looks like a complete dork in these pictures. Still running around with controlling Mommy I see. Well, she does pay all his bills, no doubt, since the loser sounds like he has no job. None of the kids got the looks or talent. Right away commenters call privileged children lazy,living-off-their-parents, Losers,etc. Working hard is a work-ethic rule certain christians follow; it isn’t “a law” that people “must” follow or be punished/incarcerated. So, you are being self-righteous when you complain about human beings not working, or not working hard. Do you know what Jack Brinkley and sisters believe in? Who are you to decide how people should live their lives? As long as it’s not against the law, to each his own, is what I say. I would be happy if my future children stayed with me the rest of my life. And if I could give them a better life than some after college drudge job with zero security, I’d do that too. I only wish all children were as loved, and financially secure as Christy Brinkley’s children. Society has brain-washed you, if you think we should all live our lives the way society promotes. I don’t plan on sending my children to school at all. I am going to educate them in the way I think best. It certainly appears that her three bland children did not get an ounce of their mother’s work ethic. They have no jobs, vacation all.the.time. and they tell the younger plain looking one she is model. LMAO! What a bunch of delusional fools. Jack looks creepy and miserable in most pictures. The Brinkley kids are nothing special whatsoever. I personally knew jack as a kid. We went to the same school in the Hamptons. Trust me: he is an incredibly self absorbed moron. The unfortunate thing about the Ross school is that there are MANY offspring of rich and famous people who go there. The result is an atmosphere which just promotes a ridiculous amount superiority and entitlement. Does Jack have a job? I didn’t think so. And the girlfriend is no doubt with him to get closer to the model mom. Jack dropped out of college and now the sister is out of college to be a “model.” Pathetic isn’t it? That girl looks like she hit every branch on the ugly tree when she fell from the top. Sailor and Jack certainly inherited their mother’s arrogance and narcissism. I think Jack is so handsome.